After a relatively long news hiatus, the impossible EM (Electromagnetic) Drive is making a comeback. Researchers from China’s space agency have released a video through state media earlier this month showing a supposedly-functional EM Drive. Have the Chinese finally made the impossible happen? Let’s not be quick to jump to conclusions here, though — at least not as fast as China did. First, let’s review where we are with the EM Drive. Prior to this month’s update, there were two supposed breakthroughs regarding the EM Drive. One was a NASA peer-reviewed paper that claimed the EM Drive can work, at least theoretically. The results, however, have been largely contested by experts and is considered controversial at best. We’ll get to why in a bit. Then, there was news that China claims to have proven that an EM Drive works and it began testing one. The latest video, presumably, shows that the tests have been successful. So what is an EM Drive? Also known as a radio frequency resonant cavity thruster, an EM Drive supposedly generates thrust without the need for a propellant. It’s an electromagnetic thrust produced by bouncing microwaves inside a cavity — like a person sitting inside a box and pushing from the inside to make it move. Plus, the total momentum generated by the EM Drive supposedly increases as it moves. The appeal of such a technology is understandable. Not only would it mean cheaper spaceflight costs, it also translates to faster space travel. Here’s the catch, though. The physics of the EM Drive goes against Newton’s third law of motion — for every action, there’s an equal and opposite reaction, which is impossible to generate in space without a propellant. So, as much as we’d love to have a device that could revolutionize space travel and make getting to Mars and beyond faster, it remains very unlikely that it’ll be this EM Drive. Nor would it be a warp drive — which, incidentally, Yahoo News says is how some describe the EM Drive. 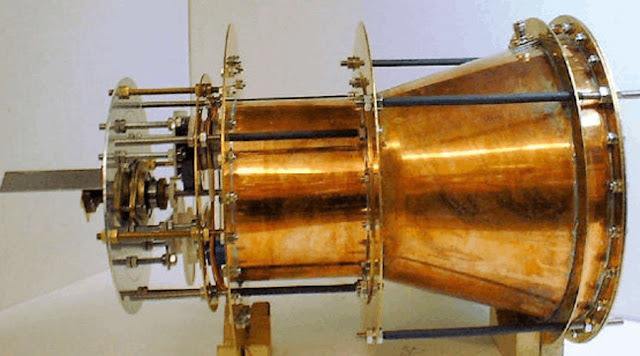 No, the EM Drive is not a warp drive, the two are very different things. A warp drive, which remains only possible in the realm of science fiction, refers to a faster-than-light (FTL) form of travel that breaks the speed of light by warping the fabric of space-time. “The bulk of scientific knowledge concludes that it’s impossible, especially when considering Einstein’s Theory of Relativity,” according to NASA. With no EM Drive and definitely no warp drive in the near (and maybe even distant) future, we’re left with current rocket propulsion technology to travel to Mars and beyond. Fret not, however, as NASA and companies like SpaceX are working on bigger rockets capable of closing the distance between Earth and Mars. Depending on how Mars and Earth align, one trip aboard SpaceX’s Interplanetary Transport System could take just 80 days. CEO and founder Elon Musk thinks rocket technology can improve to cut that down to just 30 days. While that may not be faster than light, nor supposedly as fast as an EM Drive, it’s a more realistic travel time that keeps the laws of physics intact.